A Sampling Bee: Dilly Bands Review & Giveaway! Dilly Bands Review & Giveaway! Dilly Bands are dishwasher safe and can be used in the microwave. The bands can also be boiled and sterilized. Dilly Bands won't fade, peel or wash away. The bands fit best on bottles/cups with 7.5 - 9 inch circumference. Will fit on larger bottles but text will begin to stretch. Personalizing your Dilly Bands with the choice of 6 different colors and 3 different, fun fonts! Dilly Bands are available in packs of 2, 3 & 4! Dilly Bands are great! I love the idea of Dilly Bands because I can send my son to kindergarten this fall and know that he won't get his Thermos mixed up with anyone else's. They easily stretch over water bottles, thermoses, soda cans, yogurt cups and small Tupperware containers. I love that they can be put into the dishwasher so I can wash away germs. After dishwashing, they look brand new. I haven't had any problems with the bands fading or getting frail from washing. It's nice to know that they won't get ruined if I forget to take them off. My sons love them, too. They like to wear them around their wrists as well as put them around their small monster trucks. Dilly Bands are an inexpensive way to keep your belongings safe! Dilly Bands make a great gift as well as an awesome birthday party favor. I received Dilly Bands in exchange for my honest review. All opinions are my own, always! Enter to win your very own personalized Dilly Bands! 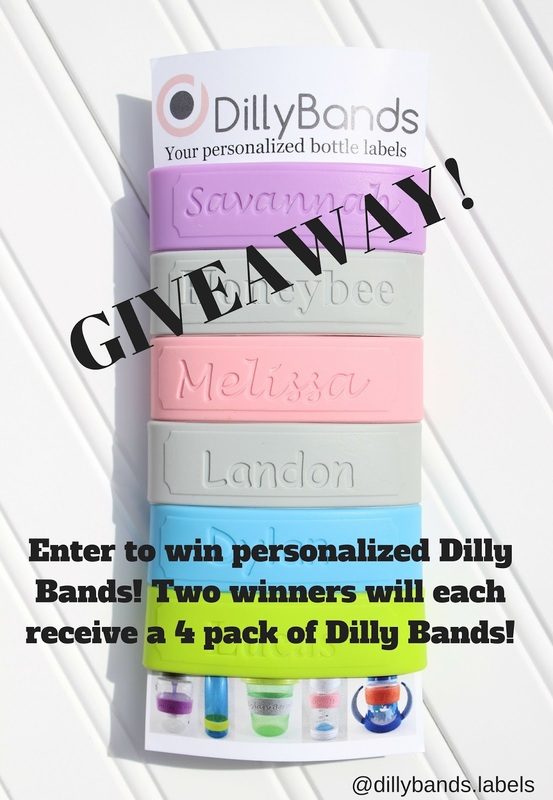 Two winners will receive a 4 pack of Dilly Bands! Giveaway is open worldwide. Winners will be chosen on August 31st! Good luck! I would use these band labels for my whole family we all have bottles and these would definitely come in handy especially with my toddler starting Preschool. Thank you for hosting a wonderful giveaway . I'm Pretty Soul (ada) thank you for all description really interesting! Yay! Dilly Bands is truly a great idea. I'm 8 months pregnant and I would love to use it for the thermos, glass, bottles, any stuff it would fit for my baby's essential to add some personal touch. My daughter says she would wear around her wrist,and then when she gies to grannys house she would put around her baby bottle. These would be a perfect gift for my nephew and niece!! Dillybands would be used plastic cups which I didn't buy in different colours. I'd use them for my water bottles. Tea It Up with Swiss Tea!